This is an article I wrote on IndyCar drivers Sam Hornish Jr. and Helio Castroneves for Brentwood Magazine. The text of the article is printed below. Have you heard the one about the Brazilian and the American who share the same goal of being the best IndyCar series driver in the world? What do you get when you combine San Paulo, Brazil’s Helio Castroneves and Defiance, Ohio’s Sam Hornish Jr.? You come up with the current roster for Marlboro Team Penske, which is akin to being the New York Yankees of the Indy Racing League. Castroneves and Hornish Jr. may not win every race, however it would be to little surprise if between the two of them they did just that, but if any other driver has plans of winning a race, they’ll have to go through Team Marlboro Penske to get there. In 2004, Hornish joined Team Marlboro Penske after IRL legend Gil de Ferran announced his retirement. If there was someone who could fill the vacancy left by de Ferran, Hornish Jr. has proven that he is that person. In fact, the stage has been set for Hornish Jr. to become a future legend himself. In 2001 and 2002, when most people his age were still trying to figure out what to do with their lives, Hornish Jr. was busy establishing himself at the top of his profession by being the first driver to win back-to-back IndyCar Series Championships; his 2002 win coming at the expense of Castroneves whom Hornish Jr. bested in the season finale in the second closest race in IRL IndyCar Series history. By age 24, when most people his age are starting to get the hang of their career, Hornish Jr. could already add, “IRL all-time wins leader and laps led leader” to his already impressive resume. Despite his laundry list of accomplishments, this Orson Welles of racing... the young, vibrant Welles with unmatched talent that is, has managed to keep an extremely levelheaded and unassuming down-to-Earth air for someone who’s prize winnings are well into the millions. The 29 year-old Castroneves has five years under his belt racing for Marlboro Team Penske and has established himself as the golden-boy of the sport, becoming only the fifth driver in history to win the Indy 500 back-to-back in 2001 and 2002. However, of the five, Castroneves is the only one to accomplish the feat in his first two seasons. Castroneves’ debonair charm and disarming smile have brought him fame beyond the realm of the racetrack as one of the sport’s most recognizable faces. The bachelor who currently resides in Miami and would listen to 50 Cent if he could while racing has made the final cut of various sexiest hunk lists across the country and is one whose charisma extends to his signature post victory celebration of climbing the track fence which began in the spur of moment after in 2000 win in Detroit. “I... was so happy man to win the race,” Castroneves says in his suave Brazilian accent. “I was supposed to go the pits and I stopped in the middle of the track, I don’t know why. I still keep trying to think ‘why.’ I look at last and the crowd was going crazy and I thought maybe they think I stop to them and I didn’t. I was just, I don’t know why I stop here, so, I decided just to get out of the car and climb the fence. When I climbed the fence, the crowd went crazy and uh, I’m like, ‘what the heck am I doing here?” laughs Castroneves. So, with both Castroneves and Hornish Jr. in driver’s seat, Marlboro Team Penske looks to continue it’s IndyCar supremacy, but what about on the day of the race? Of course, after the final lap, a race can only have one winner, so what happens when it comes down Castroneves vs. Hornish Jr.? Marlboro Team Penske found themselves in this position at the 2004 Toyota 400 at the California Speedway in Fontana when just such a situation arose. For the past two years Hornish Jr. had walked away the winner and on Oct. 3, 2004 he was looking to three-peat in Fontana and his toughest competition would come from his current teammate. History was shaping up to repeat itself as Castroneves took the pole in for the 2004 race as he did in 2003, blistering around the two-mile track in 33.1067 sec. For those unwilling to number crunch, which equates to 217.479 mph, a speed that really is no big deal for either driver. “I mean it’s different because people sometimes don’t understand,” explains Castroneves. “I mean 200 miles and hour... let’s put a hundred miles an hour, let’s drop back, you know, ordinary car... unless it’s a Lexus,” Castroneves charms. Castroneves led 145 of the 200 laps of the Toyota 400, but a couple of crashes in the closing laps caused the race to literally end on a one lap shootout around the track which saw Castroneves finishing seventh and Hornish Jr. falling three cars short of completing his undefeated three-peat at the California Speedway. 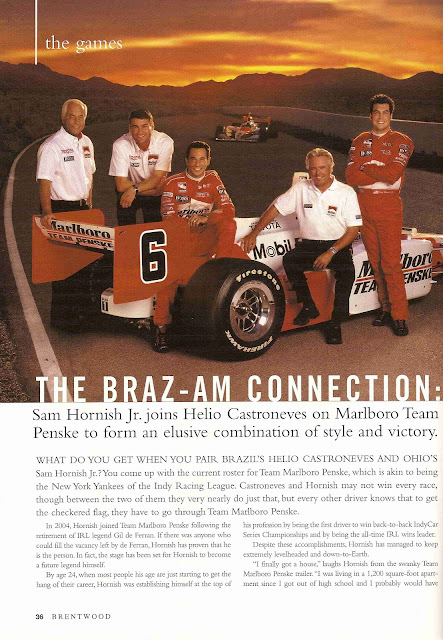 All was not lost for the members of Marlboro Team Penske. Both would end the 2004 season on a high note. Castroneves would rebound two weeks later to win both the pole and the race in the final event of the season, the Chevy 500 in Texas, feeling no pressure to be a focal point of his sport. 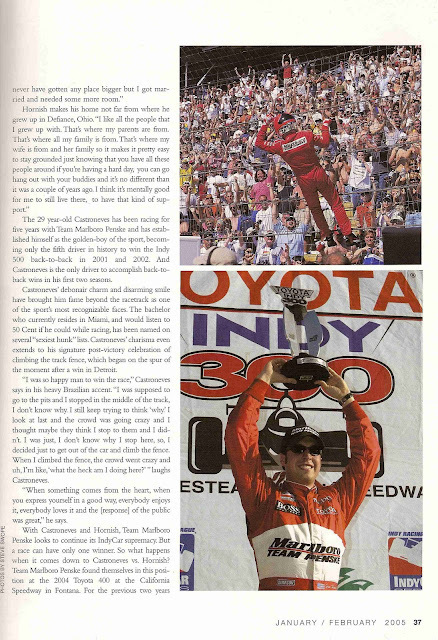 Hornish Jr. was named awarded the 2004 IRL Most Popular Driver Award, an award chosen by the fans of IRL. So, about that one concerning the Brazilian and American? It’s an international cocktail of racing excellence that’s poised to continue dominating the world of IndyCar for a long time. 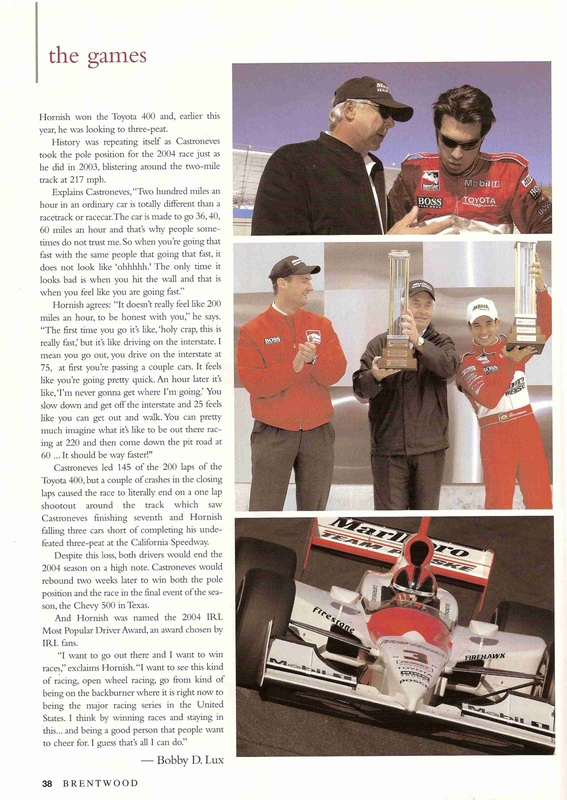 article auto racing Helio Castroneves IndyCar non-fiction profile Sam Hornish Jr.